Bosk offers contemporary, Asian-influenced cuisine created with fresh, locally sourced ingredients. 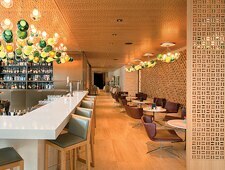 : Bosk is located within the Shangri-La Hotel Toronto, and it's right at home given its Asian-inspired motif. Diners pass the intimate hotel lobby bar before entering the stylish restaurant, which has wraparound corner windows that lend airy, expansive appeal. Created by chef Jean Paul Lourdes, who passed the helm to chef Damon Campbell shortly after opening, the menu retains its exotic and eclectic mix of international flavors. Service begins with complimentary brioche with lemon aïoli and bottomless house mineral water poured from an oversize, glass-spouted "flugelhorn." Guests can order à la carte or settle on one of the prix-fixe options. The menu is heavy on meat and seafood dishes, and it can be esoteric, so a bit of explanation may be required. Among main courses, look to Canadian-sourced fare prepared with international ingredients, such as East Coast sturgeon, blackened and served with chimichurri, or roasted duck breast with a scallion fritter and black vinegar glaze. Vegetarians have a sole selection: butternut squash agnolotti. An illuminated wall of wine displays a sampling of the 300-plus bottles available; the indecisive can take comfort knowing menu items indicate suggested wine pairings. An outdoor street patio puts you front and center with the movers and shakers of the financial district.